Big things have been happening behind the scenes at Crazy Together. Now that Rob and I are married, we can finally put all of the plans we made for building our future into action. Yes, the wedding was beautiful, exciting and beyond all of my wildest dreams and expectations. Our honeymoon was also amazing and delightfully low-key and relaxing. We intend to share lots of photos from both of those events on the blog in the coming weeks. Today, however, I am so proud to share a story with you that is so much bigger and more important than a fancy wedding or a weeklong getaway. 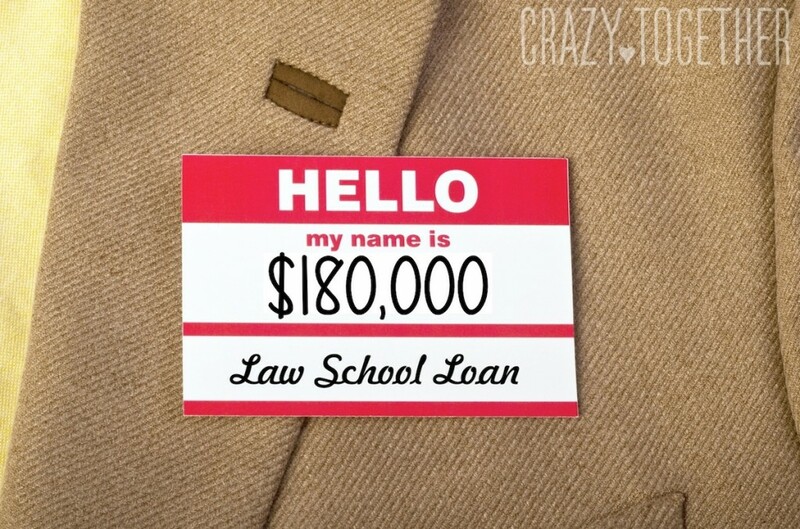 If you are a regular reader of the blog, you probably know that Rob and I were facing some serious student loan debt from Rob's law school loans. 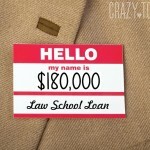 One hundred eighty thousand dollars worth of student loans to be exact. Rob was also a homeowner with a mortgage to pay, which put him even further into debt. 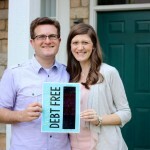 Right from the beginning, Rob openly and honestly shared his experience with debt on the blog. 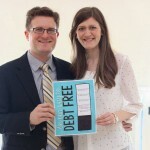 You may also know that I worked hard to keep myself free of debt for the past several years. The only debt I had ever incurred was an auto loan, which I quickly paid off within a few years and vowed to only buy used cars from that day forward and to pay cash in full. In the meantime, I worked hard, splurged on a few items for my closet, but for the most part I saved every penny that I could in the hopes of putting a healthy down payment on my first house. 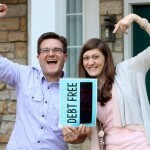 When Rob and I got engaged, we had to talk long and hard about our money and figure out how we could work together to chisel away at his mountain of debt. 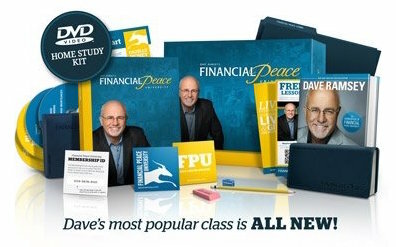 We purchased Dave Ramsey's Financial Peace University Home Study course and feverishly worked through several lessons each week. 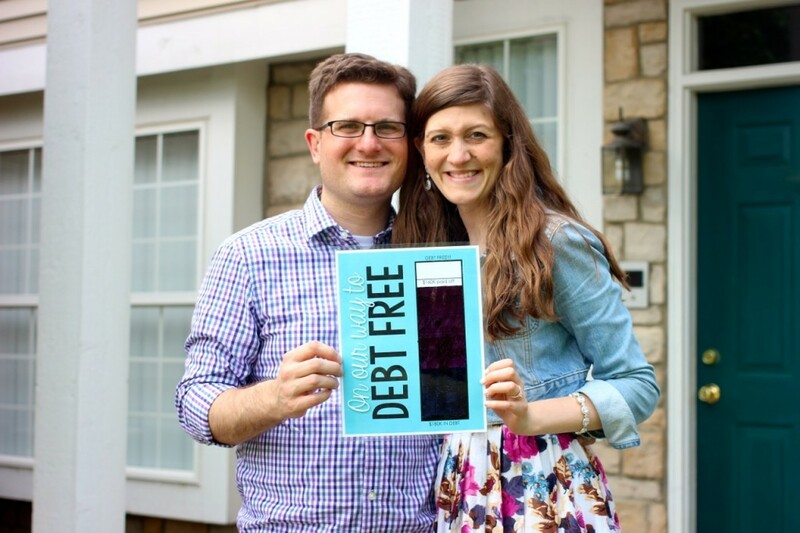 We absorbed every bit of advice that Dave Ramsey had to share and we used his philosophy to guide is formulating our own plan to dig our way out of debt. 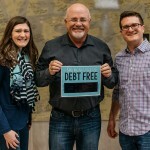 At first, Dave Ramsey's plan was one that I did not want to hear. I had seven years of hard-earned savings in the bank, which I was planning to use as a down payment on my dream house. Instead, it became apparent that I would have to let that money go and use it to help pay down Rob's debt after we were married. It was not an easy thing for me to accept at first and I cried tears of sadness and frustration as I realized that I would have to postpone that dream and build again. By now, Rob has learned that my way of coping in the face of adversity is first to cry, then to push through with fierce determination. My first step was to devise a plan to keep both of us motivated and focused on the task at hand. I created a printable chart to help us monitor our progress in pulling Rob out of debt. I created a customizable version of this chart that you can download for free by clicking on the image below. 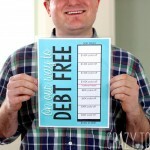 We posted the debt-free chart on Rob's refrigerator in his house and it served as a constant reminder for our goals and the work we had ahead of us. Rob worked hard and cut a lot of corners to chip away at all of the debt. For several months, the progress was SLOW. Each time he was able to apply an extra payment toward his principal, we would color in a space on the chart to mark our progress. Rob made payments as often as he could and I kept saving with a new goal in mind: helping to pay off the debt as fast as possible after the wedding. 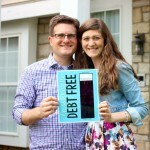 During the engagement, Rob's debt was not my responsibility (yet) and even Dave Ramsey would advise an engaged couple to keep their finances separate until after marriage. This was our plan and our unified goal, so Rob and I agreed to work separately in our plans of attack for the debt. In the meantime, we talked about our progress every week and dreamed of how our lives would look when they were finally free of debt. Since it was our plan and our progress forward, I always hopped in the photo with Rob after we colored a space on the chart. For the first several months, our progress was painfully slow, but we colored in tiny slivers of the chart each time Rob took steps toward paying his debt down. 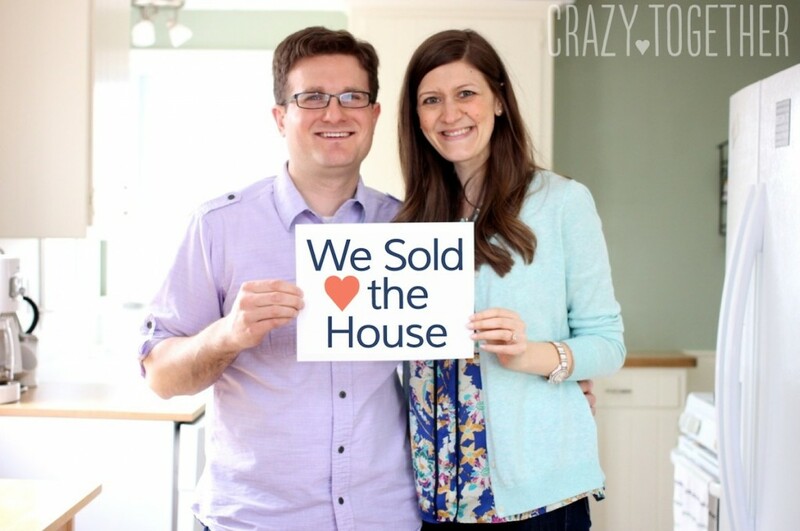 In April, we had our first BIG step forward when we sold Rob's house. 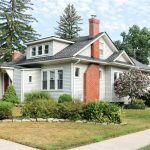 He had purchased the house after the bottom dropped out of the housing market, scored a great deal and the house had slowly been building equity over the past few years. We found a great condo to rent for our first home and were thrilled to finally color in a significant chunk on our debt free chart, thanks to the proceeds from the house sale. 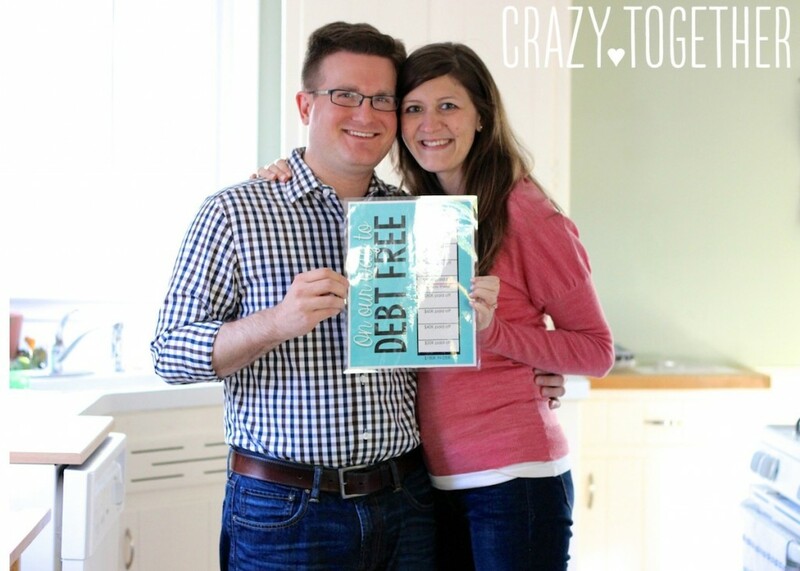 In the weeks before the wedding, life was crazy and we weren't making any visible progress in our goal to tackle Rob's debt. But the chart still sat on the new refrigerator and served as a reminder about our goals. The day after the wedding, we logged in and made a $90,000 payment toward his student loans. So where did the money come from? Not our wedding gifts. If you're connecting the dots, you probably already figured out that the payment came from my savings. Seven years of saving for a house, plus an additional year of throwing every penny that I had to spare into savings for the sake of paying down Rob's law school debt. A few people have asked me how I felt about using so much of my hard-earned money to pay down such a huge loan that I had nothing to do with. Here is my very honest answer to that question. I was actually a little nervous about it. Yes, I was completely on board with the plan and I knew it my heart that it was the best course of action for our future together. But I was also nervous that there would be some small, selfish part of me that would feel the pain of letting so much money go and have a less-than-positive emotional response to the situation. Leading up to the wedding, I was genuinely excited about making such a huge payment and taking such a huge stride forward. Rob and I would sit and talk like a couple of little kids about how amazing our wedding would be and how truly awesome it would be to make real progress forward on our financial plans. We honestly were equally excited for both events. The day after the wedding, we sat down at the dining room table and got out Rob's laptop. He logged in to his student loan account and linked it to my bank account. We were so close! He entered in the payment amount ($90,000!) and clicked “submit”. Thankfully, I didn't have a single adverse reaction to the event. In fact, I immediately wanted to color in the chart. 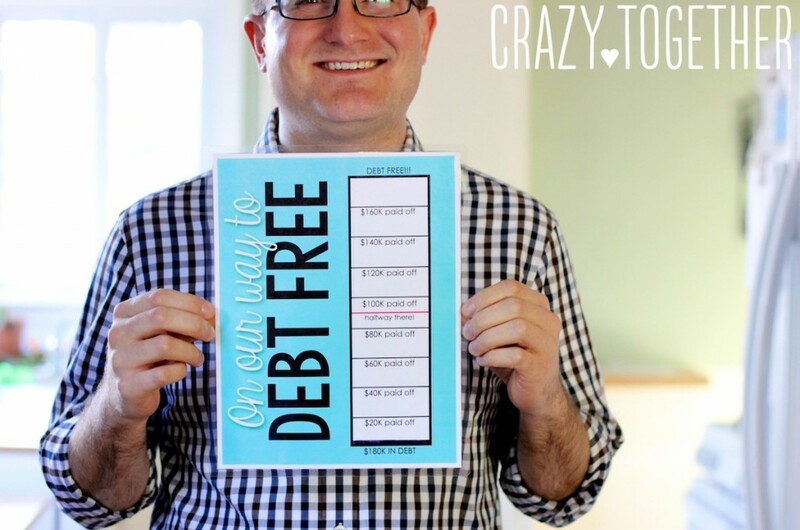 Life was truly crazy and we were so busy running around and tying up loose ends from the wedding, we decided to wait until the next day so we could truly enjoy the moment of coloring in our debt chart. The next day, after things had calmed down, we got out the Sharpie. And I watched in excitement as Rob colored a HUGE space on our debt chart. Then we grabbed the camera, went outside and posed for a photo! With only $30,000 to go (I know, that sounds crazy that we are saying it's only $30,000), we are so close to conquering the first of many financial goals! We actually have a good chunk of that money still sitting in our savings account from my original savings, but we want to make sure all of our wedding and honeymoon expenses are settled before we give all of our financial cushion to the bank. You're probably wondering what we did with any of the money we received as wedding gifts. I couldn't bring myself to use a single dime of the money people gifted to us to use as payment for Rob's law school loans. It just doesn't seem right! Rob and I have different plans for that money, which we hope to share with you in the coming weeks! One last thing! If this story sounds too good to be true, I promise you it is not. We were faced with so much crushing debt, being able to see the light at the end of the tunnel is such a relief! 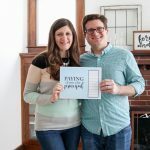 Left to our own financial plan, we would have spent my savings on a house we couldn't afford and would still be saddled with $180,000 in debt. The plan Dave Ramsey lays out in Financial Peace University sounds crazy and backwards from what society teaches us to do, but his logic, math and foundations from the Bible are sound. 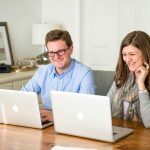 Rob and I feel so deeply contented about our finances because of the program and we highly recommend FPU to anyone that is frustrated about their finances or just looking for reassurance that they are on the right track. Note: This was not a sponsored post in any way. We didn't even include affiliate links in this post. Rob and I just really believe in the value of Dave Ramsey's philosophy and the financial plan he outlines in FPU! Since this post originally published, we finished paying off a grand total of $250,000 in debt from Rob's student loans and mortgage! 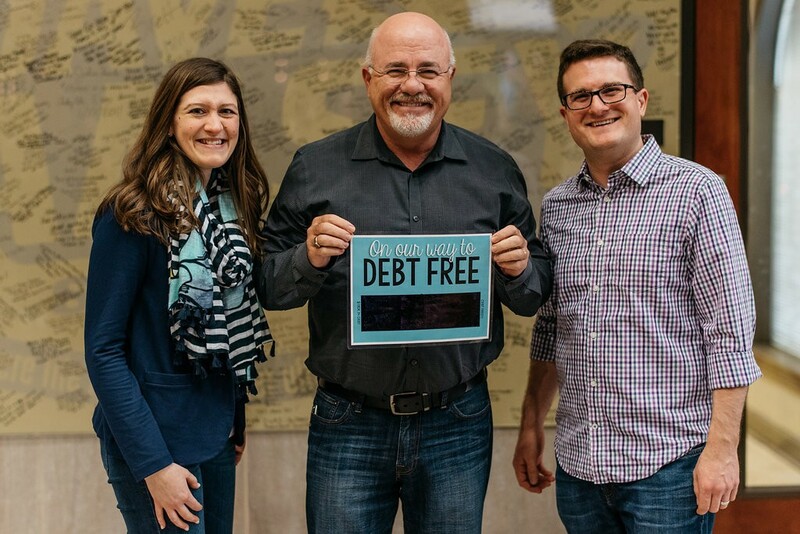 To celebrate our Financial Peace University success, we went on The Dave Ramsey Show to do a Debt Free Scream in February 2016. You can read all about it in this post and hear our impressions of the man himself, Dave Ramsey. You can read more stories about how we paid off my student loans and mortgage by clicking on any of the images below. I’m so happy for you! 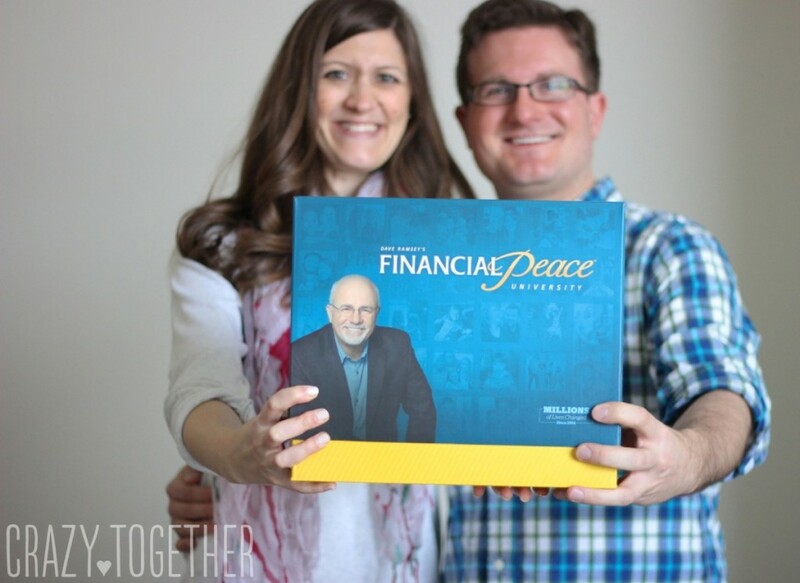 Dave Ramsey’s Financial Peace changed our lives, too. You are so blessed to start your married life with this financial plan and knowledge. Your chart encourages me to make a chart showing how much we owe yet on the house (our only debt). God has great plans for you both, of that I am certain. Congratulations! Congratulations! You two are such an inspiration! 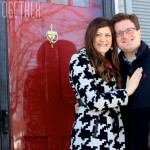 Thanks for sharing your story- it has inspired my husband and me! I don’t usually comment on your posts, but I just have to say I love your Financial series because it’s so encouraging to me! I’m trying to dig myself out of 25k worth of student loan debt, and it’s so encouraging to read real-life stories of other people who want to change their family tree. Keep up the great wrok! Wow!!! What an incredible story!!! I loved reading every single word!! So many people choose to live for the now, but I love that you made a decision that will benefit your future too!! I am so happy for you and proud to call you my friend!! Wow wow wow! 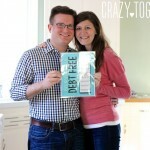 I found your blog this spring when I googled ‘debt payoff chart’ and have been following ever since! My husband and I took FPU through a local church about 2 years ago. To say it is life changing is an understatement. We hopped on board and were hitting it hard, then we just got stuck in a rut and kind of quit doing it Daves way. I got re-inspired when I found you two! We have no credit cards, no car payments, and no debt except for my husbands student loan (and our home). He has been out of school since 2003 and yet we still owed over $30k. So very frustrating. I am a stay at home mom with two little boys so trying to find extra money to throw at the loan each month is hard. Buuuut, we have managed to sell a few things and really look hard at our spending and have paid $5k since April!! We have our chart on the refrigerator and it is so fun to color it in! It has been so awesome to make progress and know that we are kicking this loan out of our house and lives forever. I am ready for the ‘fun’ stuff like saving for college and retirement :) Congratulations to you for making huge strides in becoming debt free! This is an awesome blog! Thank you for sharing your journey of paying down a huge student loan! I have been delaying my student loan debt for a couple of years now. My parents are urging me to start doing something about it. Your story has really motivated me to start paying off my student loan, too =). Thanks! Maria I love this so much! My husband and I took the FPU course as soon as we got married and I am SO THANKFUL. 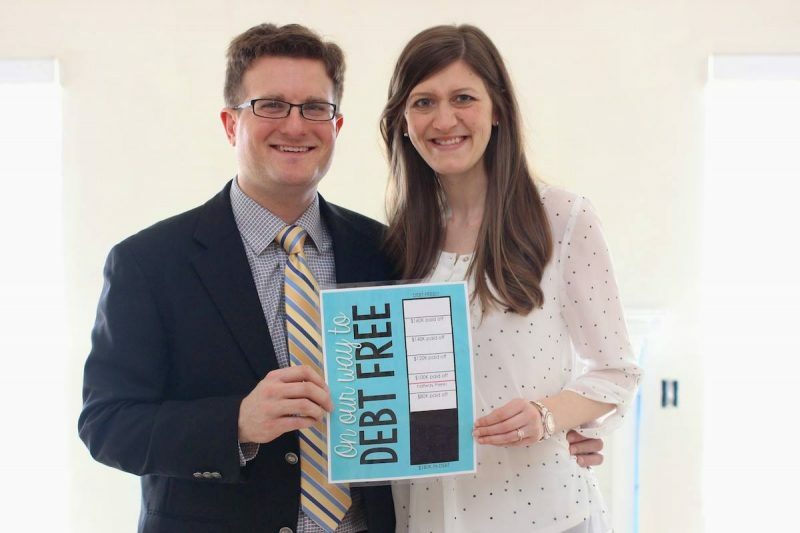 We have paid off almost all of our debt in just two years. We watched people our age going out to eat every night and planning big vacations and it was hard but soon we will be debt free. I’ve been watching your progress and it has been inspiring not only for me but to know that there are others out there like us! Thanks for being so open and honest about that mountain of debt and how hard it is to sacrifice. It will be so worth it in the end! I don’t know what you guys have planned to celebrate paying it off completely but I hope it’s something huge! We are going to Europe :) Hopefully in 2016! Yay for goals!